In an interview with Valor, the head of Brazil’s largest private-sector bank said that the political issue continues being the greatest risk to the Brazilian economy in 2017, especially because of Operation Car Wash, the probe into a vast kickback scheme centered on Petrobras contracts. But he stressed: “It looks like President Temer is not involved in any type of problem and therefore the government will continue.” To him, the investigations may lead to the ouster of another minister, without this changing the direction that the country has taken. Mr. Setubal reckons that the spending cap the government managed to pass in Congress “in a way shields Brazil against potential populist attempts” in the presidential election of 2018. Mr. Setubal considers the ideal candidate to the presidency as someone who follows the current economic plan. He sees an increase in foreign interest in Brazilian assets, with growth of mergers and acquisitions in 2017. He also signals a decline in banking spread and for recovery of credit after two years of contraction. Valor: Davos is ending precisely when Donald Trump is taking office, amid uncertainties. What impact do you see for Brazil? Roberto Setubal: There is much uncertainty regarding the measures that he [Mr. Trump] will seek to implement. Particularly for Brazil there is not something that will impact us directly. Brazil may be impacted indirectly as other countries are affected. But at this moment, for Brazil, we don’t have much to worry about. Valor: What is the impact to the dollar, for example, with the stimulus that the Trump administration wants to give to capital repatriation of American corporations? Mr. Setubal: This also doesn’t affect Brazil. Most of this money is sitting in tax havens where there are big incentives with low taxes. This repatriation already more or less announced by the American authorities is likely to have some effect on the dollar, but I don’t believe it will be relevant. The dollar is a currency with huge liquidity. The economic growth and the interest rate compared to other places in the world are much more decisive factors for the exchange rate of the dollar. Valor: How do you evaluate the speech of the Chinese president here in Davos, which could have been the speech of an American president before? Mr. Setubal: Positively. It is a way of China reaffirming its intention of integration into the international institutions, which were created by the US itself after World War II. The Chinese president strongly advocated free trade, as a way of [stimulating] the important global growth that would benefit everybody. It is important what was said, especially coming from China and at this moment. Valor: What is the perception in Davos about Brazil? Mr. Setubal: Some things surprised me, in relation to Brazil, here in Davos. First, a quite big lack of knowledge of all measures taken by the government, which were recent, it’s true. There is no clear understanding yet of how they can impact Brazil and even which measures are being passed. The visit of the Brazilian delegation to Davos was quite timely to communicate these measures. They were very well received, caused good impression at this moment. Valor: Are the measures enough to really restore the confidence of the business world in the country and abroad? Mr. Setubal: There is a perception that Brazil is heading in the right direction. I’ve seen several panels, including with participation of Brazilian authorities, and praises for the measures adopted. There is also a perception that all of this takes time to have effect. The recovery of the Brazilian economy will happen, it will not be overnight, but it is clearly a very important change of route. The level of confidence in the Brazilian economy greatly improves with everything that was shown in Davos. Valor: When will Brazil have a firmer recovery? Mr. Setubal: When we compare the end of 2017 in terms of GDP with the end of 2016, we will have growth possibly above 2%. It is clearly a path of recovery that will lead already in 2018 to a better GDP. Valor: You have been mentioning the political uncertainty as main risk in Brazil. What risks? Of testimonies from plea bargains hitting President Temer? Mr. Setubal: I think the Brazilian economy’s risks are really much more linked to the political issue than to the economic path. The uncertainties I see mainly from the [Car Wash] investigations that are taking place. Now, I don’t believe much that the investigations may affect so much the current government. It will affect much more the electoral scenario of 2018. It looks like President Temer is not involved in any type of problem and, therefore, the government will continue. Eventually, some minister may have to leave, but this will not change fundamentally Brazil’s path. Valor: For the nation’s presidency, of the politicians out there do you see viable candidates, free of legal problems? Mr. Setubal: I think this scenario is not yet clear. We have candidates to be candidates. Over the [Car Wash] investigations one or another may become not viable — or viable. But it is early to tell; we have to wait the beginning of next year to have more clarity. Valor: In your opinion, what would the profile of a good presidential candidate be, considering the recent economic situation? Mr. Setubal: The ideal would be a candidate that continued the work that is being done in economic matters. We have to think of Brazil always in the medium and long runs, and the continuation would be quite important to gain confidence in the Brazilian economy. And evidently it would have to be someone who is not involved in any of the Car Wash investigations and who has a reformist, modern profile, of bringing new ideas. Valor: Don’t you see risk of strong more extremist candidates? Mr. Setubal: I think we are more likely to have candidates who advocate the continuity of the current program, which is exactly the opposite of what was being done, and that clearly had no success. I think the population would certainly reject a candidate that had a program like the previous one, which brought these problems we are facing at this moment. I also think the passage of the cap on public spending was an extremely important measure, especially in the long run for Brazil, and would greatly limit the possibility of a populist government wanting to base on public spending. The PEC [constitutional amendment proposal] of spending control in a way shields Brazil against potential populist attempts. Valor: The Social Security reform, as proposed, is sufficient at the moment? Mr. Setubal: If they pass exactly what is proposed there, I think it is sufficient, we will have a very big relief and will remove this matter from the agenda certainly for many, many years. The ideal is that they passed as it is because it would combine perfectly with the PEC of spending cap. When you compare what is being proposed for Brazilians with pension rules that exist in the developed countries, after approved, the new rule in Brazil would still be much [more] generous than in Germany and other richer countries than Brazil. Valor: What micro-reforms do you think can effectively move forward this year? Mr. Setubal: The agenda is very intense. 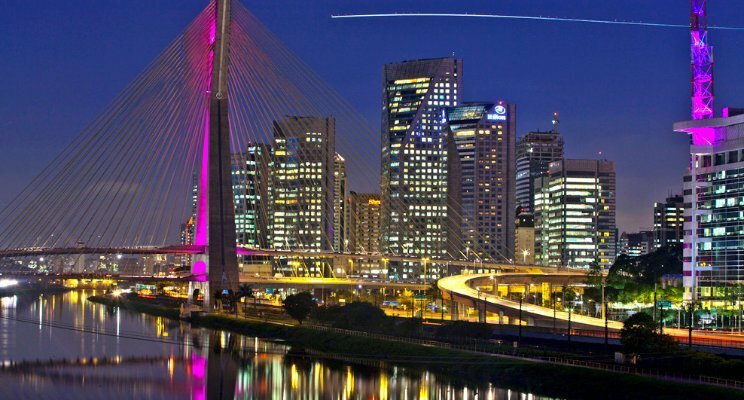 I think the idea of improving the business environment in Brazil is very relevant. There is a series of small measures that already are in a way in the government agenda, like facilitating the opening and closing of companies. This in Brazil is too complicated, and the reform would greatly ease the life of small businesspeople who, at the end of the day, are who move the economy. Valor: Reforms are being outlined, the monetary policy is more flexible and the government calls for banks to lower interest rates. Will this happen soon? Mr. Setubal: No doubt the Central Bank started easing the monetary policy with a rate cut of 75 basis points. I think we will watch a quite consistent and sustainable decline of the Selic [base interest] rate, and reach a single digit maybe at the end of this year or beginning of 2018, depending also on the international situation and on American rates. This has impact on the rates that banks charge on their loans and I believe they will also fall, it will be absolutely natural and inevitable. Interest rate has two very relevant components. One is the Selic rate, which is falling, and the other is the level of risk in the economy, which is also improving. Valor: Do you see risk of new renegotiation of corporate debts that were already negotiated in 2015 and 2016, given the delay in the recovery of the economy? Mr. Setubal: The business environment is improving, the economy begins recovering and we have general improvement in default rates. We are seeing several companies selling subsidiaries, assets, to reduce their debts. At Itaú, we’ve never had such a big pipeline of mergers and acquisitions. There is a lot of interest of foreign investors in Brazil. All of this is helping companies that manage to sell some important asset to rebuild their cash flow and their indebtedness. Some new renegotiation may happen, always when the company shows it has viability. It is important that, in rescheduling the debt, there is a future prospect of debt amortization. Valor: Could we have a record of mergers and acquisitions in Brazil in 2017, even because the assets are cheap? Mr. Setubal: Brazil precisely has this combination of interesting, cheap assets, very good companies being sold, as we saw with CPFL, Alpargatas and others. There are indeed possibilities of a very high volume of M&A. I don’t know if it will be a record, but it will be a quite busy year. This shows a big dynamism of the economy and confidence of foreign investors in Brazil. Valor: What measures would have the greatest impact on reducing spreads? Does the bank see this reduction taking place already in 2017? Mr. Setubal: I believe so. The fall of interest rate and the reduction of the delinquency risk contribute greatly. We are still experiencing a high risk level, but the trend is for it to ease over the year. We will see a relevant decline of the spread. Valor: How do you combine the reduction in interest rates on loans with improvement in the margin of these transactions? Mr. Setubal: The environment of lower rate greatly contributes to improvement in default rates. And the lower rate and reduction of delinquency allow a smaller spread, at the same time in which the bank maintains its profitability. It is the environment in which everybody wins. Stability in the economy is very important because of this, for bringing confidence, capacity of planning. Valor: Itaú is leader in the card market. How will it be affected by the reduction of revolving credit? Mr. Setubal: The Brazilian credit card system has a series of distortions that comes from the time of too high inflation. It is possible to bring the revolving rate down, reduce terms, redistribute the fee. Now, this has a quite big impact in the credit card industry, changing a little the value chain. And it has relevant impact on some companies that may be positioned only at certain points of the value chain. For Itaú, which is positioned at all points of the value chain, we understand that in all we will be able to maintain a good return. The reduction of terms is not a problem for Itaú, the bank has a very big funding capacity. Valor: Can the reform of revolving credit be done this year? Mr. Setubal: I think so, but we must have some care because what we have in the Brazilian system is the very high revolving rate compensating the no-interest installment plan that is made in the account. This combination is dangerous, with a small volume that pays a lot of interest and a very big volume that pays no interest at all. This cross subsidy must be properly adjusted. Valor: Will the bank continue using excess capital to make acquisitions? Mr. Setubal: We are always looking at possibilities of acquisition. In Brazil, what we see today are specific niches of the financial market. Last year we had these three small deals for the size of Itaú [purchases of Recovery, BMG Consignado and Citibank]. We don’t see any other big acquisition in Brazil. And there’s always the possibility of some acquisition in Latin America, but at the moment we have nothing in sight. Valor: And about provisions for nonperforming loans? Have the big cases of corporate default ended? Mr. Setubal: We will probably watch a reduction in the volume of provisions to be made. This will contribute favorably to the bank’s earnings in 2017, as we have less credit losses ahead, because we’ve already made a lot of provisions now. Valor: And what about credit demand? Mr. Setubal: We believe that in 2017 we will begin seeing growth again in credit operations, after two straight years of decline. The economy’s recovery leads to greater credit demand, combined with reduction of delinquency. Valor: How is the bank’s succession process? Has the new CEO, Candido Bracher, already taken over most of the day-to-day functions at the bank? Mr. Setubal: The succession at Itaú is following as planned. It was announced well in advance that Candido Bracher would be chief executive of the bank from May 2017, exactly to make a quite smooth transition and for him to get acquainted with all issues. The bank is very big, very complex. He was more involved in wholesale operations, and now he is getting more involved in retail banking and technology, so that by April he will be quite prepared to take the functions. Candido is an executive of great quality, with long banking experience, and we are quite optimistic that he will conduct an excellent management. Valor: What will you do then? Mr. Setubal: I will share the post of chairman of the board with Pedro Moreira Salles. Over the years, the board grew much in importance. More recent regulation imposed a series of responsibilities of supervision, monitoring, oversight, even in the matter of technology because of risks that come from cyber-attacks. I will be following what is happening at the bank. Valor: How do you leave Davos, with all this discussion about populism, uncertainties etc.? Mr. Setubal: I return more at ease to Brazil, precisely because I see how the country has conditions of having a quick improvement, that is, in the next two years. And there is a clear support of the international business community for that to happen.